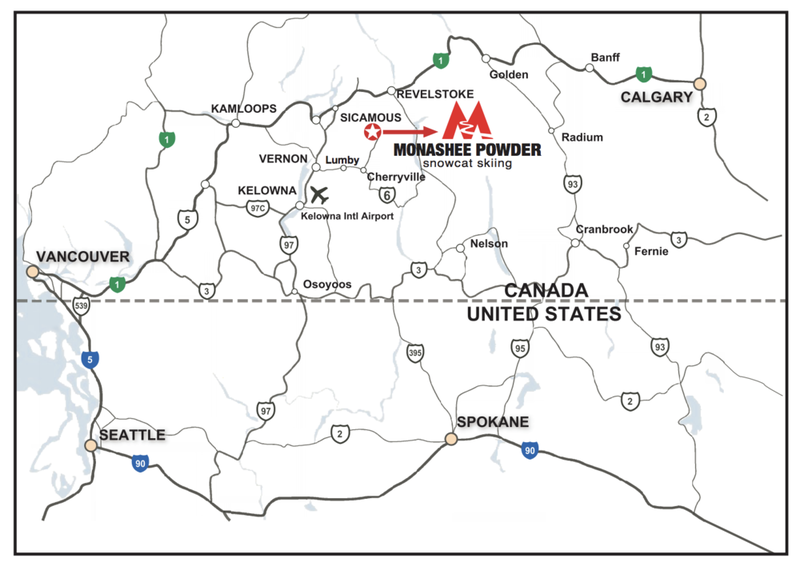 Where is Monashee Powder located? Our lodge is located in the Monashee Mountains in British Columbia, Canada – About 30km southwest of Revelstoke and 30km south of Highway 1(as the crow flies). The only access is from Cherryville, BC on Highway 6, between Vernon and Nakusp. This airport is serviced by Air Canada or West Jet airlines via Montreal, Toronto, Calgary or Vancouver. Horizon Air/Alaska Airlines services the Kelowna airport from Seattle. Your flight needs to arrive by noon on the day before your ski dates. Rental Cars and SUV's from most agencies are available at the Kelowna airport. See information on our bus service below if you do not wish to rent a car. We can get you back to the airport on the last day of your trip by 7:10 pm for flights departing at 8:10 pm or later to Vancouver, Calgary or Toronto. Unfortunately, there are no flights to Seattle after 7 pm, however there is an early morning flight. There is a new hotel being built across the highway from the airport, as soon as it opens we will provide details for you. We have a shuttle bus that will pick you up at the airport at noon on the day prior to your ski dates, and it will return you to the airport on the last day of your trip by 7:10 pm. The cost is $78.40 per person incl. tax for a return trip. Our driver will find you at the Information Kiosk by the luggage carousels. Travel East from Vernon on Highway #6. Stay on Highway #6 through the town of Lumby, go straight ahead at the 4-way stop. The River Ridge Golf Course is 21 kms from Lumby on the left side of Highway #6. Look for the Monashee Powder sign. You can park your car at the golf course. From here we all take the shuttle bus to the trailhead. The shuttle bus departs Cherryville at 1:45 pm, and will take everyone to the TRAILHEAD. At the Trailhead we meet the snowcats which will take us the remaining distance up to the lodge. Warm clothes and good winter boots are recommended. You are venturing into the backcountry after all! What time & where do I meet the Monashee bus? We have a shuttle bus that will pick you up at the Kelowna International Airport at 11:45am on the day prior to your ski dates, and it will return you to the airport on the last day of your trip by 7:10 pm. The cost is $78.40 per person plus tax for the return trip; please contact us ahead of time as reservations are required. Look for the bus with the snowflakes on it! If you are not flying in, you will need to be at the Cherryville Golf & Roadhouse Cafe on the afternoon before your trip. The bus will stop here briefly to pick up guests and will be leaving for the trailhead by 1:45 pm. What kind of training do the guides have? Monashee Powder Snowcats is dedicated to providing a high standard of professionalism and safety that is mandated by the HeliCat Canada Association. As members of this association, our guides are trained and certified by the Canadian Avalanche Association (CAA) and Association of Canadian Mountain Guides (ACMG) organizations to which MPS also belong and support. Each group of 12 guests is led by two or three guides, who are well versed and experienced in avalanche hazard forecasting, weather analysis, emergency mountain first aid, mountain rescue and even ski instruction techniques. Each of our guests is equipped with an avalanche transceiver and given a lesson on how to use it. Guests must be strong intermediate skiers capable of dealing with deep powder snow in the backcountry. A visit to Monashee Powder will usually entail skiing both open bowls and steep tree runs. Powder skis make skiing deep snow much easier for any skier; however, you should be comfortable skiing black diamond runs. We reserve the right to restrict unskilled skiers from participating, but we will try to help guests improve so they can join the group on the easier runs. No refunds will be available for these guests if they can’t handle the terrain. What type of skier should I be? The cost to rent these skis is $35 per day. An early rise ski refers to a tip that is bent up but the tail remains the same. For powder skiers this means the ski tips float up out of the deep snow without the tendency to dive. The new rocker or reverse camber ski can be as extreme as having a bent up tip and tail, similar to a u-shape. These skis are the fastest growing innovation in ski design, they are purpose-built for big lines and backcountry skiing. For more information about Rocker skis click here. For more information about camber skis through videos click here. Poles are provided along with rental skis. Guests must bring their own ski boots. The majority of our guides and guests use the wider powder skis. For maximum enjoyment of your holiday we recommend that you also use them. For Snowboarders: We have a selection of powder boards available for rent, from 156 to 166 cm in length for $35/day. There are bindings on the boards, but bring your own and an adaptor plate (or your own bindings) just in case your boots don't fit our bindings. To hold your reservation, a deposit will be paid upon reservation with the remainder of the fee due October 31st. Wilderness skiing and snowboarding involves certain risks, dangers and hazards in addition to those normally associated with downhill skiing and snowboarding at a ski area. These risks, dangers and hazards are outlined in our Release of Liability, Waiver of Claims and Assumption of Risks Agreement which guests will be required to sign at the lodge prior to skiing with us. It is important to be aware of Monashee Powder Snowcat's poor weather policy: Please accept that we have no control over the weather - and with our limited number of guests and short season - we must operate even in poor snow conditions. Monashee Powder Snowcats does not provide replacement ski days, refunds, or rain checks for down days lost to weather or snow conditions (e.g. unusual torrential rain, unskiable crust, etc.). The lodge will remain open throughout the ski season, even in poor conditions. If you have any allergies, medical conditions or dietary needs, please let us know on your registration form. We normally ski 10 - 14 runs per day. On the first day of your ski holiday you will likely ski approximately 12,000 vertical feet due to the morning beacon search. On subsequent days you will ski between 15,000 and 18,000 vertical feet. No, we do have some exciting runs, but most runs are not extreme. We ski a variety of slopes during the day, the steepness that we ski is dictated by the group’s ability and by the avalanche hazards. During times of high avalanche danger, we will ski runs that are of lower angles and supported by trees. Are the runs really steep? Yes, if there is room guests can combine trips. Our longest visitor stayed for 11 days! Luckily he was very strong and very young! By checking our availability schedule, guests can put trips together to make 5, 6 or 7 day trips beyond the usual 3-day long weekend or 4-day mid-week trips. This is a remote lodge, so guests who want to depart in the middle of a 4-day trip will have to have a vehicle with 4-wheel drive at our trailhead. The logistics can be worked out with Tom & Carolyn. Can I put two trips together? We welcome everyone to come and enjoy our powder. Snowboarders and telemark skiers need to be experienced in all backcountry conditions including treed terrain. Our guides do their best to accommodate all of our guests. However, there may be times when traversing and uphill climbing is necessary. All of our guests are asked to complete and return the registration form. Our chefs can accommodate any special dietary requirements and food allergies but we must receive your form before you arrive. Please email or mail the completed form to us prior to your arrival. Forms that are sent by fax may not be picked up in time during the season, so email is recommended. Please do not bring beer since it is heavy and often breaks on the trip up (usually on someone else’s luggage!). A corkage fee of $15 per bottle is charged for wine. Monashee Powder’s bar stocks a selection of liquor, beer and fine B.C. wines. Can I bring my own beer and wine? Powder skis if you own them, otherwise you can rent ours. Check out our new fleet of rental skis. We provide ski poles with fat baskets for guests who rent skis. Wear your ski jacket, snow boots and gloves on the bus and snowcat when you arrive. Bring any medications you regularly take, there isn't a drug store nearby! Our wake-up call is at 7 am which includes coffee served in the Guest Chalet. Breakfast is at 7:30, and guests make their own lunch from the sumptuous lunch buffet with a large variety of meats, cheeses, home-made bread, salads, fruit and treats. Then we head out to ski at 8:30 am. While riding on the cat, guests snack or eat lunch as they please, with water bottles provided. Guests arrive back at the lodge about 4:30 pm, to enjoy appetizers, drinks, the two hot tubs, a game of pool, view they day's photos on the flat-screen TV and share a few stories with new friends before dinner at 7:00pm. There is also the option of a therapeutic massage from our registered massage therapists before or after dinner.